We partner with parents to help kids discover and follow Jesus. Our desire is for every child to know and experience God’s great love for them! 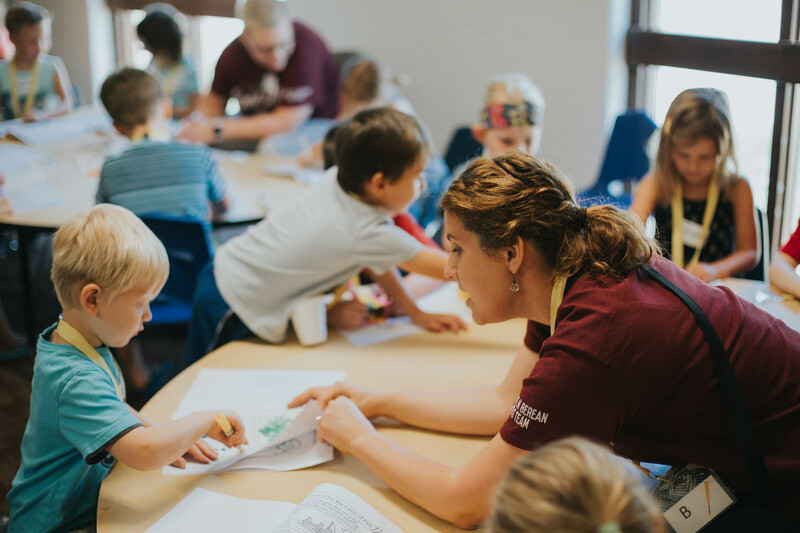 At LBC Kids, all children (babies through 5th grade) experience safe, age-appropriate environments where the Bible is taught in a creative, engaging, and relevant way. We believe church should be fun – God loves to hear kids laugh. We provide a safe, loving environment for children in nursery, preschool, elementary and special education. Children are taught God’s Word through creative, hands-on Bible stories, singing, and activities. Join us Wednesday evenings for Kids Clubs! We offer a variety of learning environments that will help your child apply God’s Word to their life. You can also come early and enjoy a meal with others – check out our Wednesday Night Meals! We host several special events throughout the year such as Vacation Bible School, Halloween Party, Family Nights, Child Dedication, baptism weekends and more. We have a check-in desk designated for first-time guests. Here we’ll meet your family, register your child in our database, and connect you with a volunteer to show your child their classroom. On your first visit, we recommend arriving 15 to 20 minutes early. For babies, our goal is simple—that your child will begin to learn and understand that God loves them. Through the care of our committed volunteers, kids experience the love of God. In addition, our nursery incorporates a prayer time and our walkers room has a story time each hour. These early encounters let each child know they are valued and begin to build a foundation for a relationship with God. Preschool provides purposeful connections in which kids discover who God is. Each week in preschool, LBC Kids team members build relationships and model God’s love to kids through free play followed by a Bible story, worship songs, and small group time. Each Sunday in our elementary program, kids connect with an LBC Kids team member and other kids their age to sing and worship God, hear a creative Bible story, and discuss that story in their small group. In these teaching environments, kids learn that their identity is in Christ, they have belonging in the church, and a role to play in God’s mission. We believe that each child matters. Since not all children are able to learn in a traditional setting, we provide options for kids with special needs — including one-on-one buddies within the classroom environment — that allow them to connect to God’s Word on their level. Are your children angry, hurt, and confused about your separation or divorce? A DivorceCare for Kids (DC4K) group is a safe, fun place where your children can learn skills that will help them heal. Groups are designed for children ages 5-12. Child Dedication at Lincoln Berean is a practice in which parents make a solemn commitment to raising their child in the faith: in knowing Jesus as the only hope for bringing reconciliation between God and humanity. Parenting classes and Child Dedication services take place throughout the year. Special weekends are designated to celebrate baptism together as a community. Prior to these, parents may discern with their child when they are ready to publicly proclaim their faith through baptism. In order to help you both with this decision, classes will be available for parents wishing to learn more about leading their child in the decision to be baptized. In addition, both parent and child meet one-on-one with a Children’s Ministry Pastor prior to baptism. Our mission at Lincoln Berean Church is to present every person complete in Christ, and we believe this starts with our kids. Would you be willing to serve the kids and parents of your community? A variety of roles are available on Sundays and Wednesdays, from leading kids and welcoming families, to singing songs and telling stories. This summer kids will focus in on some amazing, real-life encounters with Jesus while heading out on an adventure like no other. Registration opens June 1. > We're currently looking for volunteers–contact Amy if you're interested! They’re excited to share the love of Jesus with kids and not afraid to step on small, sharp toys. Meet our Kids’ Ministry team! Have questions, or ready to get involved? Either way, we can’t wait to help. Just fill out the form below and we’ll get back to you in a jiff.